Whilst those of you in the northern hemisphere are getting into the spirit of summer, winter is finally here in Australia. A lot milder than the winters we were used to in England, truth be told. This morning was 'cold' by South Australian standards - it's 12C and sunny! That would be a nice spring day back in London. Anyway, it's certainly cold enough for the kidlets, so I have been getting my crochet on - Alice badly needed some new hats! 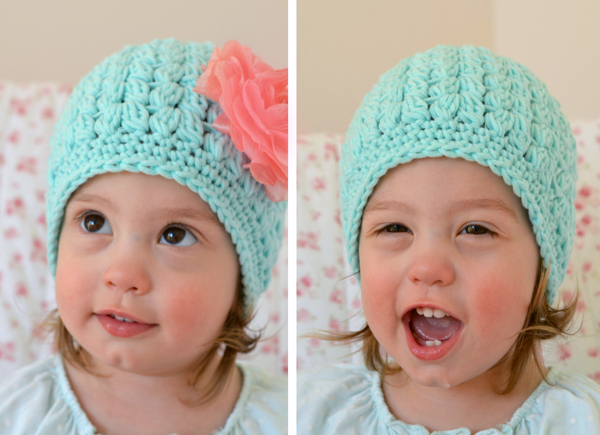 My little girl is absolutely hat crazy, I am very blessed in that regard. She is a pro at putting them on herself with no help. If her hat comes off whilst playing, she stops whatever she is doing, puts it back on, then continues from where she left off. This new beanie is definitely one of her favourites. 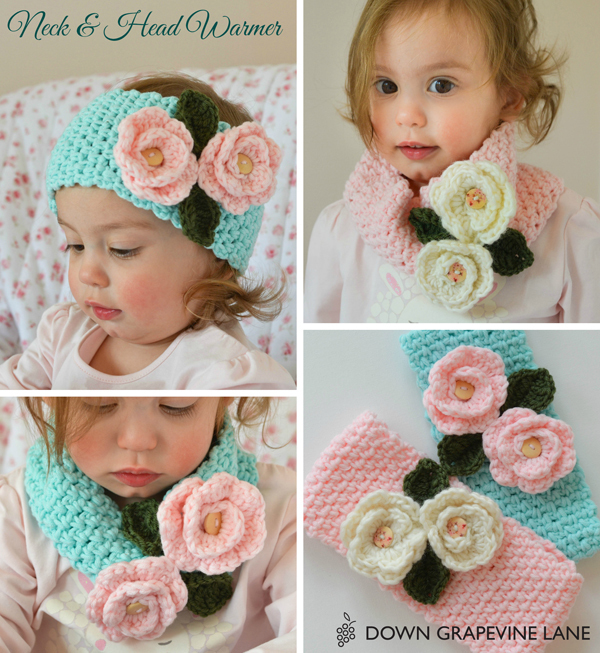 The pattern is Cherub Cheeks by Amanda Tipton and you can purchase it here. 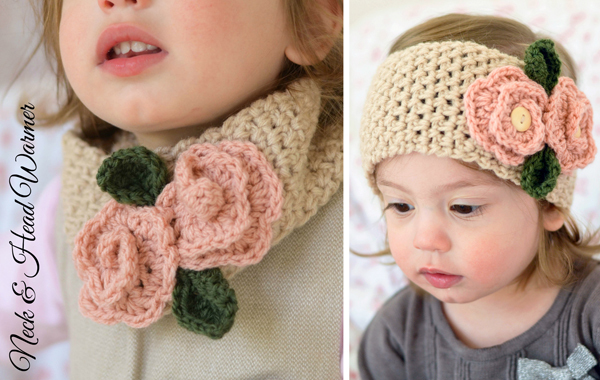 I also wanted to make a scarf for her, and came across this very clever pattern for one that also doubles up as a headband. It's by The Velvet Acorn on Etsy and she has lots of other great patterns too, especially if you like the more 'chunky' look. The leaves on this warmer are knitted in the original pattern, but as I can't knit I crocheted the leaves. I do like the look of the original leaves better though, so maybe I need to take up knitting? Those who can knit, is it easy to learn? I confess I am loving winter this year. Something so cozy and comforting about snuggling under a wool blanket by a nice warm fire, eating roasted chestnuts whilst watching the rain fall outside. I had missed this. Just before I go - I apologise for the sporadic posts of late. Thank you for bearing with me, I promise I haven't lost the blogging drive! I have recently finished my last project for Homespun magazine, my third with them and the biggest one to date (it looks awesome, I can't wait to show you). That took a huge chunk of time out of my normal sewing schedule, so I fell behind with shop orders, yada yada. I am finally back on top of things now after way too many sewing sessions into the early hours of the morning. I figure people don't stop following blogs for not posting regularly and I would rather not post 'fluff' just for the sake of posting. I hope you agree. And whilst my kids are so little and they need mummy so much, they are my top priority. But I will blink and they will be at school, and my days will hopefully get less crazy. It's my new mantra... it's not forever! 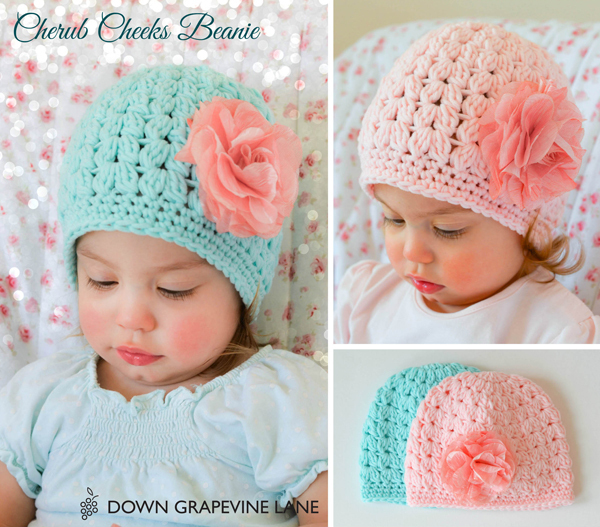 Those little hats are soooo sweet! I don't think knitting is hard to learn at all -- for most people it's just a little awkward at first, learning how to hold your hands. But, just like anything, practice makes perfect. I prefer knitting to crochet -- my hands don't get as tired as quickly. Also, I hate to be the bearer of bad news, but your days probably won't get less crazy. It will just be a different kind of crazy. Even now, my kids are grown and we spend a lot of time running -- and all my friends laugh and say the same thing. We joke about the days when our babes were young and we thought it would get less busy. Take heart though -- it's an amazing ride!! !